Introduction: The oncological safety of laparoscopic surgery (LAP) in rectal cancer remains a matter of controversy, although total mesorectal excision (TME) for rectal cancer has been proposed to have long-term advantages. Methods: From May 2003 to Dec 2007, 259 mid and distal rectal cancer was resected with curative intent in Seoul National University Bundang Hostpital. Preoperative chemoradiation therapy was performed in 79 patients. This study aimed to evaluate whether laparoscopic TME (n = 112) has long-term and short-term efficacy compared to open TME (n = 147). 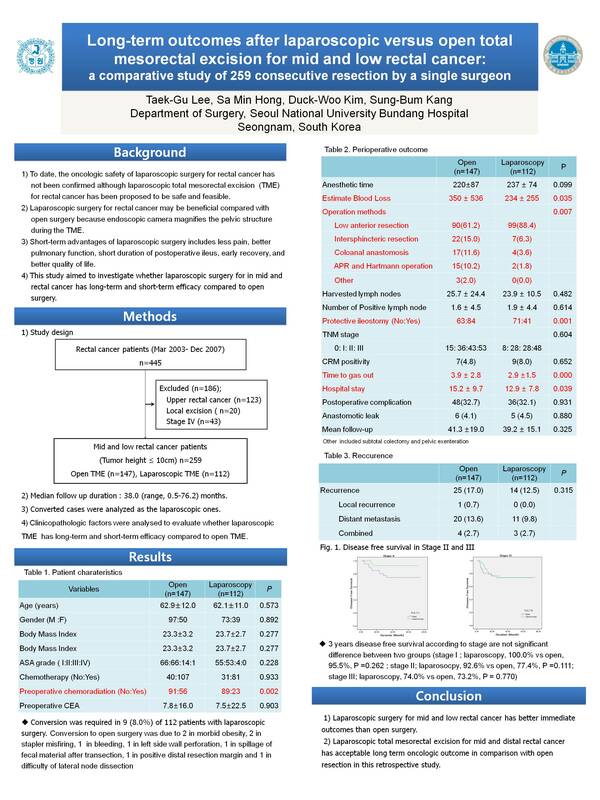 Results: Gender, age, body mass index, preoperative CEA, preoperative chemoradiation therapy, TNM stage were not statistically different in both group. Anesthetic time was not longer in LAP than open surgery group (237 ± 74.2 min vs 220 ± 86.9 min, P = 0.099). Conversion to open surgery was required in 9 (8.0%) of 112 LAP patients. Involvement rate of circumferential resection margin and the mean number of harvested lymph nodes were not different in both groups, respectively (8.0% vs 5.9%, P = 0.652; 23.9 ± 10.5 vs 25.7 ± 24.4, P = 0.482). Complication of anastomotic leakage was not higher in LAP (4.5% vs 4.1%, P < 0.05) although diverting ileostomy was performed less in LAP than in open surgery (36.6% vs 57.1%, P = 0.001). Time to gas out and hospital stay were shorter in LAP group, respectively (2.93 ± 1.45 days vs 3.88 ± 2.79 days, P < 0.001; 12.94 ± 7.8 days vs 15.2 ± 9.8 days, P < 0.001). On the follow-up of 38 (range; 1 – 76) months, local recurrence rate was not higher in LAP than in open surgery group (1.8% vs 3.4%, P > 0.05). Three year disease free survival rates was not different in both group according to stage (stage I, 100.0% vs 95.5%, P =0.262 ; stage II, 92.6% vs 77.4%, P =0.111; stage III, 74.0% vs 73.2%, P = 0.770). Conclusions: Laparoscopic TME has better immediate outcomes with acceptable long term oncologic outcome in comparison with open TME.